There’s a place on this beautiful earth of ours that experiences average daily maximums of 41.1C (106F). I’m not talking the average in the height of summer. I’m talking every single day of the year. 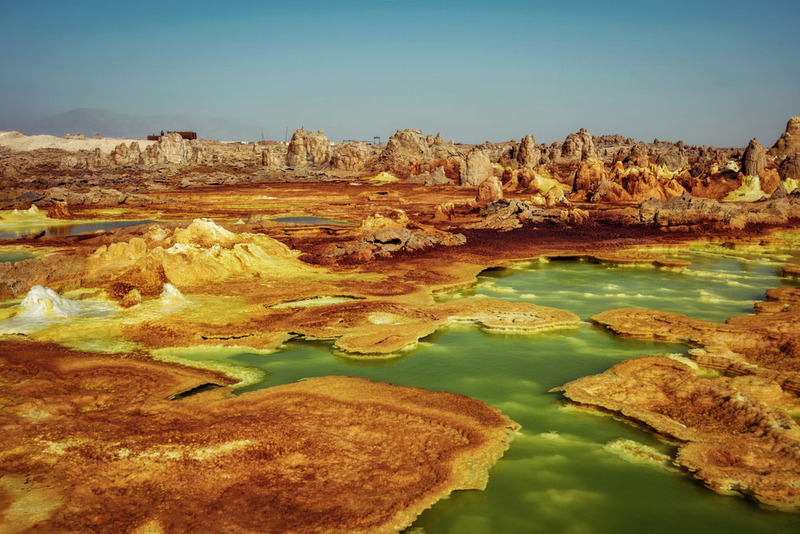 Dallol, Ethiopia is the hottest inhabited place on earth. It can be found in the very heart of the Danakil Depression, a long-evaporated inland sea that forms the lowest point of the African continent. This is the most desolate of desolate lands; one of hardened lava, the stink of sulfur and endless, ominous nothingness. Sounds great, doesn’t it? Good, because you need to go. Such are the extremes found here that the Danakil Depression is perhaps the most incredible place I’ve ever visited. Mother Nature threw out the rule book when she cooked up this joint and those who brave the extremes are rarely, if ever, disappointed (just be prepared to lose a little sweat along the way). What makes a low-lying patch of dirt in Northern Ethiopia such a must-see? I’m glad you asked! Erta Ale lava lake, Danakil Depression, Ethiopia. Erta Ale is unique. 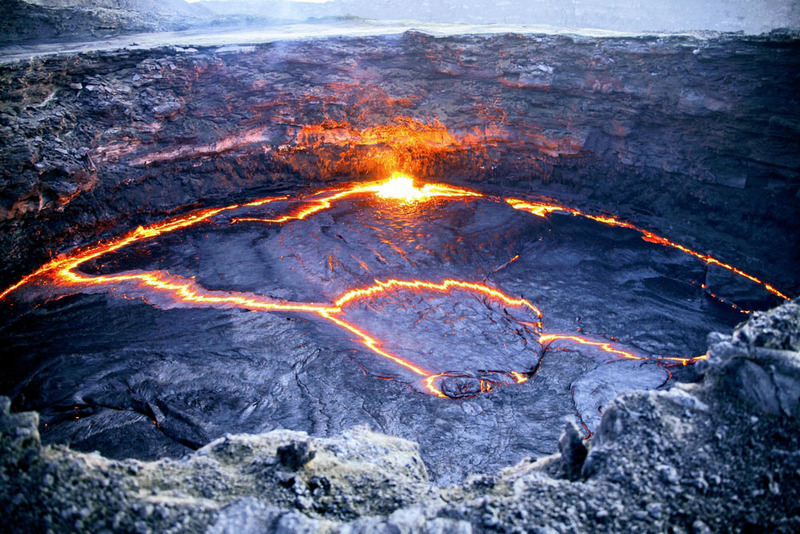 Not only is it the world’s lowest lying volcano, it is also home to the world’s longest-existing lava lake, which is one of only six in the world. A lake made of lava is exactly as cool as it sounds. Standing at the edge of an active volcano and watching the molten rock bubble away is at once mesmerizing, humbling, and scary. And throwing rocks into the lava is wildly satisfying. Getting to Erta Ale is no mean feat. After the sun goes down and takes a few degrees of heat with it – night time lows during my July visit were a chilly 35C (95F) – you’ll be asked to hike for 3-4 hours, including a steady climb up the ever-steepening curve to the rim. Here you can enjoy the show for an hour or so, then you’ll make a camp just a few hundred meters from the lava lake. Finally, you’ll get up a few hours later to take in the view from the edge as the sun rises. Salt mounds on the banks of Lake Afrera, Danakil Depression, Ethiopia. Fed by underground streams, Lake Afrera would be quite the desert oasis, if it weren’t for the sky high levels of salt and sulfuric acid. Instead it is just a 100 km² (39 sq mi) expanse of lifeless water, farmed for its minerals by locals. But don’t let the complete lack of life stop you from jumping in! Lake Afrera is Ethiopia’s own Dead Sea – human bodies float like corks, and the minerals in the water are terrific for the complexion. If you pick your spot wisely, you may even find freshwater hot springs (because everything is hot around here) that will help you wash off the salt crust. Fun fact: Lake Afrera features a single island – Franchetti. With the lake itself no less than 102 m (335 ft) below sea level, this is officially the lowest lying island in the world. Caravan of camels transporting salt, Danakil Depression, Ethiopia. Imagine this for a job opportunity. 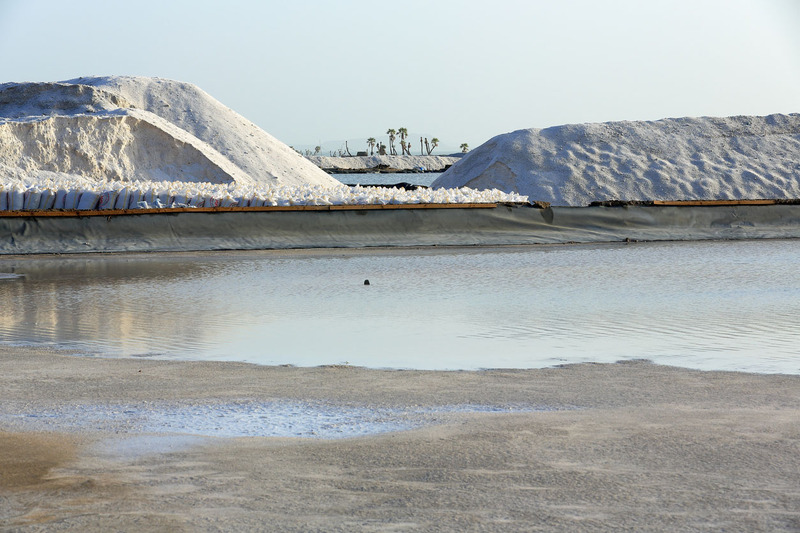 Your work day consists of spending 8-10 hours in 50C (122F) heat, without any shelter, performing the hard manual labor of cutting blocks of salt from the surface of a lake. Welcome to the life of the salt miners of Lake Karum, an endless expanse of white close to Dallol. I’ve never seen anything like it. I was on the verge of passing out after spending ten minutes doing nothing more than talking to these people. But like machines, they continued to saw, lever, slice and dice, taking a break only to wave the flies from their face. If that doesn’t sound like the career for you, don’t worry, you’ve got options. How about the life of a caravan driver? Responsibilities include walking your camels 7 days over desert and salt pans from the nearest major township of Mek’ele, packing the beasts with 200kg of salt apiece, and hiking back to sell it. Sulfur hot springs in Dallol, Danakil Depression, Ethiopia. You’ll wonder whether being the ham in a heat sandwich has finally got to you at the sulfur hot springs of Dallol. With serious warmth coming from the sun above and the springs below, you might be confused as to whether the vibrant colors of this alien landscape are the work of nature or heatstroke. Let me assure you that it’s (almost definitely) the former. Name a color of the rainbow, and these springs will likely serve it up. The vibrant yellows, reds, blues and greens more than make up for the unmistakable tang of rotten egg offered up by the sulfur, which takes a good hour to get used to. Make sure your camera batteries are charged for this photographer’s paradise. 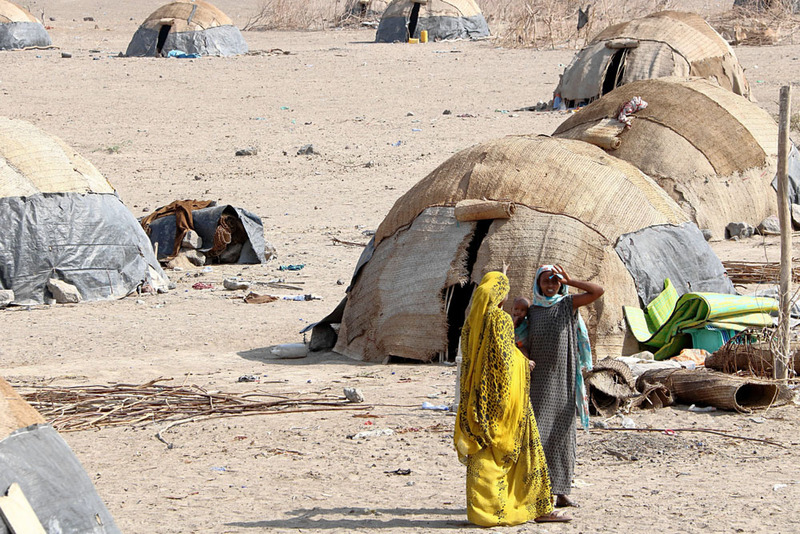 Typical Afar village, Danakil Depression, Ethiopia. 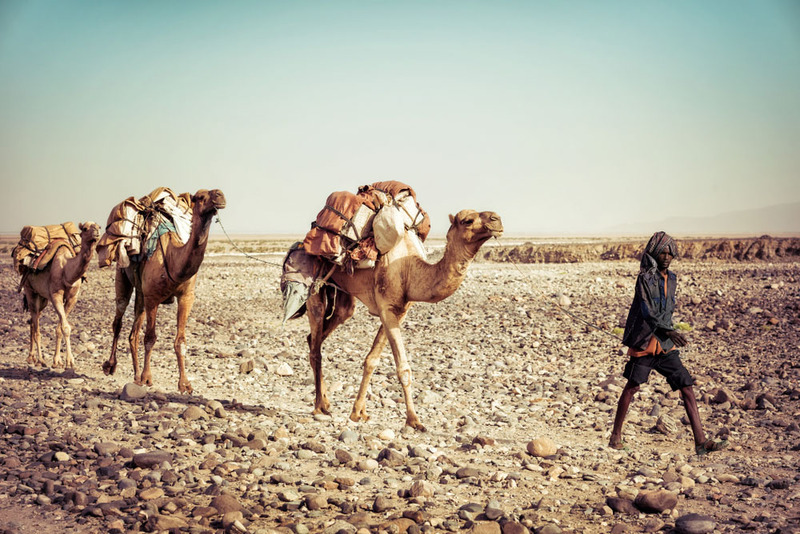 The Afar, the local nomadic tribes that somehow manage to not just survive but thrive in this unlivable place, have been called the toughest people on earth. They’re dotted throughout the Danakil, generally in the places where you would least expect them, and learning about their culture and way of life was one of the more meaningful experiences I had on the tour. However, they have a reputation for being reclusive and wary of outsiders, so don’t expect to hear much from the horse’s mouth. More often, you’ll see them floating between their huts and tending to their camels. Where to go: Most tours leave from the nearby city of Mek’ele, a 14 hour drive north of Addis Ababa. When to go: Avoid late-July to early-September as this is the hottest period, with most companies stopping their tours. Who to go with: Ethio Travel and Tours are the biggest name in Danakil tours, and are great at what they do. If you have flexibility, book in their office in Addis Ababa or Mek’ele for a discounted rate – you can get a nice deal if you are willing to top up a tour (as long as you haggle).